Early birds and late-risers; Spinit has a bonus for all! We’re welcoming you to the world of Spinit! Spinit cares how players want to play; they want their users to do it their way, and they’ve gone to great lengths to ensure there’s something for everyone throughout the week! So, whoever comes through those rotating doors, Spinit’s prepared! For every player, there’s Spinit’s Welcome package. A welcome bonus split into four stages, along with 20 Free Spins given each day for the next 10 days after opting in! All players need to do is hit Deposit to call up the Cashier, select their payment method, deposit amount and tick ‘I want a bonus’ to see any Bonuses available in the dropdown list. Select First Deposit Bonus and click Continue. Players will need to enter information according to whichever payment method has been selected, such as card details or Skrill credentials, for example, before proceeding. Once confirmed, players’ Balances will be updated! To kick off the week, Spinit serves up a ‘We Love Mondays’ promotion where users can score a 25% up to £100 Bonus – not bad! Players looking to gobble up the maximum offering of this spin-credible promo can net a total of £500. If that’s not the perfect start, Spinit still knows how to take players into business end of the week with Wednesday’s ‘The Spinner Choice’! Players who have made at least two deposits of £10 including one deposit that week, can receive yet another superb Reload Bonus and Free Spins. All players need to do is check their inbox to find out which Game of the Week their spins can be played on. And for the weekend warrior? Enter ‘Weekend Spin’! Depositors of a minimum of £20 on Friday or Saturday can kick back with a cool 50% up to £100 Bonus and, you guessed it, 20 Free Spins. What more could a spinner want? Forget the PC; Spinit’s taking you out onto the open road! At Spinit, there’s no such thing as a great day to spend indoors! They want players to spin anywhere they please. Whether players are travelling to somewhere new, in a queue or even on the loo; there’s no environment, big or small, where players can’t pop Spinit right out of their pocket and play towards some awesome prizes. That’s right! Anytime, anyplace, anyhow! Spinit boasts a simply stunning tally of slots optimised for its Mobile site… Over 500 and counting! This Casino knows that where tech invention’s concerned, there really is no limit! That’s why Spinit ensures fast gameplay, super-sharp graphics and the very latest Mobile games, which, when coupled with some unparalleled industry-leading promotions, slots fanatics will find out in no time that Spinit really is the platform for them. Fund it, spin it, win it. Job done. So, what’s the value of super-speedy spinning and killer promos on the move if there’s nothing in the kitty? Spinit takes care of the heavy lifting here too with a cornucopia of ten-strong payment methods available to use so players can deposit instantly and securely! Payment methods include credit cards such as VISA, MasterCard, and Paysafecard, as well as mobile services such as Zimpler; e-wallets such as Neteller and Skrill; and even bank transfers. Spinit ensures that security takes priority, which is why all financial information and data is safeguarded through the latest SSL encryption technology. And when players do get lucky at the reels and pocket a win from a spin, Spinit has various withdrawal times depending on the method, with the likes of Neteller and Skrill making players’ winnings instantly available, whilst Bank Transfers may take up to five business days. As well as keeping financial information safe and secure, Spinit makes sure its players are treated exactly the same way with a range of options in place to help them stay in control of their gambling. By accessing Responsible Gambling at the bottom of the site, players can access an abundance of information on Deposit Limits and Self-exclusion, as well as a Questionnaire to encourage players to stay mindful of such topics as time spent gaming and loss-chasing. They also allow players to set up and configure their own limits whether they want to put a cap on their deposit amount per day, week or month, or they want someone to pop their head in and let them know that time is flying, and they should take a break – Spinit has it. To top it off, there are a series of links to Gambling Counselling Organisations such as GamCare and Gambling Therapy to aid players in search of advice, help and even counselling. Players can fund their account and claim some awesome bonuses in the process, but what’s it all for? Oh, that’s right! With six providers in the offing and over 1,300 games available, there’s no end to the sensational spinning available right at players’ fingertips with Spinit! And that’s a fact – Spinit are introducing new slots all the time in New Games, so whether players come back for their road-tested favourites or they’re on the lookout for a new spinning experience, there’ll never be a grey moment when gamers play with Spinit! In NetEnt’s Mega Fortune, players are invited to live the good life and spins towards some limousine-sized wins over five reels; or if the table’s where the fortune’s found, Immersive Roulette from Microgaming will put the player right at wheel to spin towards a heap of conquests over the croupier. Or for the daredevil, there’s Book of Dead, powered by Play’n’Go. Join Rich Wilde in his temple quest towards some fabulous fortunes! Table Games’ payouts can dither anywhere between 97.84 and 99.27%, an RTP range that’s not to be baulked at; whilst slots can shoot as high as 96.98%! We know players want their balance to boom, and at Spinit, that’s exactly what players get! What’s more, for the real house experience, players can indulge in a little Live Casino play. Offerings of the Roulette Lobby from NetEnt, boasting European, Immersive and French variants, or even Microgaming’s Blackjack, with an eye-popping 99.83% RTP are bound to keep players entertained on the floor for countless Casino sessions! Wherever and whenever gamers like to spin, Spinit’s got all players covered with some state-of-the-art offerings from industry leaders, NetEnt, Nyx, Evolution Gaming, Microgaming, Play’n’Go and Quickspin to get them reeling! Whether they try to beat the dealer in Live Casino games, indulge in some eye-watering graphics in Video Slot game or drop the big one in Jackpot games, players are sure to find something to whet their whirring wants. Get Spinning then turn gold! Some companies offer tiered VIP schemes starting at bronze, escalating upwards gradually over time… not Spinit! When you spin here, it’s all Gold, boys and girls! As well as offering perks and pleasures built around each individual, relating to players’ Birthdays and even their Anniversary with the Casino, Spinit also offers a Monthly Prize Draw! Each month. All VIPs need to do is play with Spinit and they’re in with a chance of winning an amazing princely prize. Couple that with an unrivalled carousel of promotions and support on offer, the only thing Spinit doesn’t do is hit the reels for you! In addition to all the bonus-y bits, players taking part in Spinit’s VIP scheme can take advantage of some seriously world-class, bespoke, premium Customer Support around the clock. When we say players can Spinit their way, we mean it. Everyone can get access to personalized treatment by VIP account managers, who are always on hand to deal with any requests or queries. Players are pampered with exclusive weekend promotions, personal cashback offers and Bonus Plans; a service built entirely around one person… the gamer! Come for the spins and stay for the service! Still unsure about it all? Spinit gives its players not one, but three ways to get in touch. Friendly, educated Support Agents are always at the end of a phone, email or Live Chat to ensure gamers have everything they need to play safely and responsibly! At this Casino, that simply isn’t enough! Spinit wants its players to know that a first-class service is all part of the company’s ethos to ensure they come back time and time again! What’s more, Spinit has a boundless onsite facility containing FAQs regarding all manner of popular queries. From registration through to cyber-security, players know they’re in good hands in letting Spinit take care of the hard yards, so they can get right down to the business of having fun! What’s left for us to say? All in? Let us put our cards on the table. 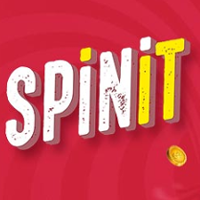 We think Spinit’s a real ace in the hole offering a service from the first deposit, first spin, first bonus, first interaction that’ll keep players reeling for a long time to come! Spinit has the perfect marriage of form and function which players will love! A unique mixture of jolly graphics displaying some of the Casino’s most memorable characters and critters will keep players mesmerised. Sound cluttered? Not at all, despite Spinit’s visual prowess, the usability is remarkably clean. Users will be able to navigate game types with ease, laid out neatly beneath the top banners. And that’s before we’ve even tapped a single navigation link at the top of the Casino where players can peruse features such as Promotions, VIP and Support! Not forgetting that handy little Spinit logo to take you home again for some classic spinning and winning. Attractive promos, world-class Customer Support, heaps of payment methods, an unrivalled Mobile experience and an abundance of top games, Spinit has the full suite! What more do you need to get you hitting the reels?